The Fightins are halfway through the rigors of spring training, and although their record is typically subpar, it's really been an uneventful spring. Chase Utley's repaired hip is on schedule to have him ready for the opener. Jimmy and Shane are off doing their thing for the ole U.S.A. The 5th starter issue is working itself out. Ho-hum, right? Not any more. I believe in the Bill Simmons theory that teams earn a 5-year grace period from having to endure the ire of their fans after winning a championship. So, this Phils season, I'm going to try to remain upbeat. However, I certainly expect, cough, I mean HOPE that we'll be treated to competetive baseball all season. So, when it came out today that Cole Hamels was coming back to Philadelphia to have his elbow checked, I had pretty much the same feeling I would imagine I'd have if I was 15 and heard the words "I'm pregnant." It was never more evident that Hamels is the engine that makes the Phils machine go than during their run to the title last season. We know what the team was built around. It's a couple hundred strikeouts (cumulatively) away from being an offensive juggernaut. It will always pile up the runs. 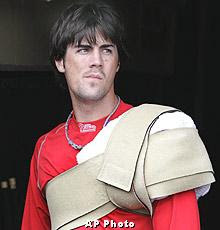 But pitching wins championships, and Hamels has established himself as a premier arm in the show. Without him, the Phils would be in a little more than big trouble. The Fightins do have some depth on the hill this year. With Chan Ho Park, Carlos Carrasco, Kyle Kendrick and J.A. Happ, there are some wings waiting in the wings to fill in should Hamels have to miss some time, but if that time is significant, this rotation will have serious problems. The more I think about it, Park would be the more efficient 5th starter. Happ would then replace Hamels. The junior version. The lanky lefty. The changeup. But not the polish, or the experience of the NLCS and World Series MVP. Brett Myers came into camp trim and determined. But do you really want him to assume the role of the ace? He's not exactly the sharpest tool in the shed upstairs so I'd rather keep the weight out of there. Jamie Moyer is 46. He's done enough. Lets just hope he can get through most of his starts without having to leave the mound 12 times a game because he has to go to the bathroom. It's probably nothing though, right? Imagine a Philadelphia sports fan overreacting to a doctor appointment. That would never happen, right? He'll be fine. He'll toe the rubber April 5 and leave Chipper and the boys spinning in the batter's box. After all, we're the city where good things happen to our sports teams, aren't we?